← Portland, Oregon. August 8th, 2011. Dockweiler Beach, California. August 10th, 2011. The Los Angeles City Bureau of Street Services is looking into a report of a sinkhole that’s been left unattended since the rains of last December. The hole is west of the airport on Vista del Mar, about a half-mile north of Imperial Highway. It now extends into the southbound lane on Vista del Mar. 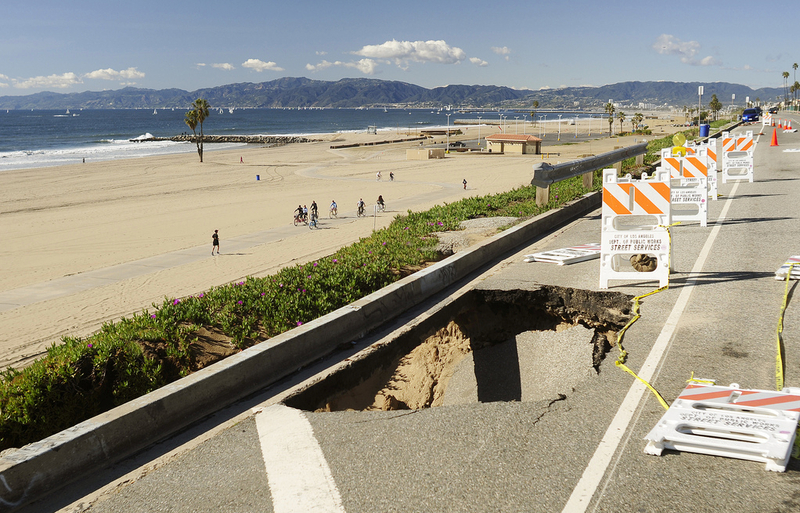 This entry was posted in Pictures and tagged Dockweiler Beach, sinkhole, Vista Del Mar. Bookmark the permalink. 1 Response to Dockweiler Beach, California. August 10th, 2011. They shouldn’t be “looking into it” they should be fixing it! It’s been almost a year!